In this highly competitive and challenging markets, getting your products and services known to the mass market is tough and highly expensive. Therefore a lot of companies turn to the internet, In the early days where there is less website, getting people to reach your website is easy, but as the number of website volume grows, it is getting harder and harder for your clients to be able to get to your website. Most of our clients told us of their disappointment after spending a huge amount of money and time in getting their website setup and then not generating enough visit to reach their expectations. We are here to help, our approach is to understand your short term and long term target and work out the ideal marketing solutions for you. 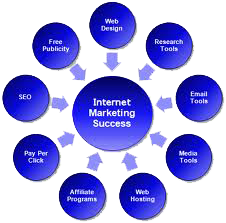 Most of our clients approach is to use email marketing and pay per click marketing to handle their short term and immediate target, and then work on the Search Engine Optimization for thieir long term target. Working with offshore partners, we are in a better position to offer you the best ROI you can get, Our prices is low and our results is great. Do contact us and make an arrangements for our sales consultants to go down to your office and give us a chance to understand your needs and propose a no obligation online customised online marketing solutions for you. No hard sales, because the price offered to you will definitely be hard to resist. For further information you can check out the followings in details. Running on our own VPS Server, We are in a better way to control the total number of host in our server, Giving you fast and high performance for your web and email services. In this highly competitive and challenging markets, getting your products and services known to the mass market is tough and highly expensive. Micro System Solutions Pte Ltd.
© 2013 Copyright by Mircosystem Solution. All rights reserved.